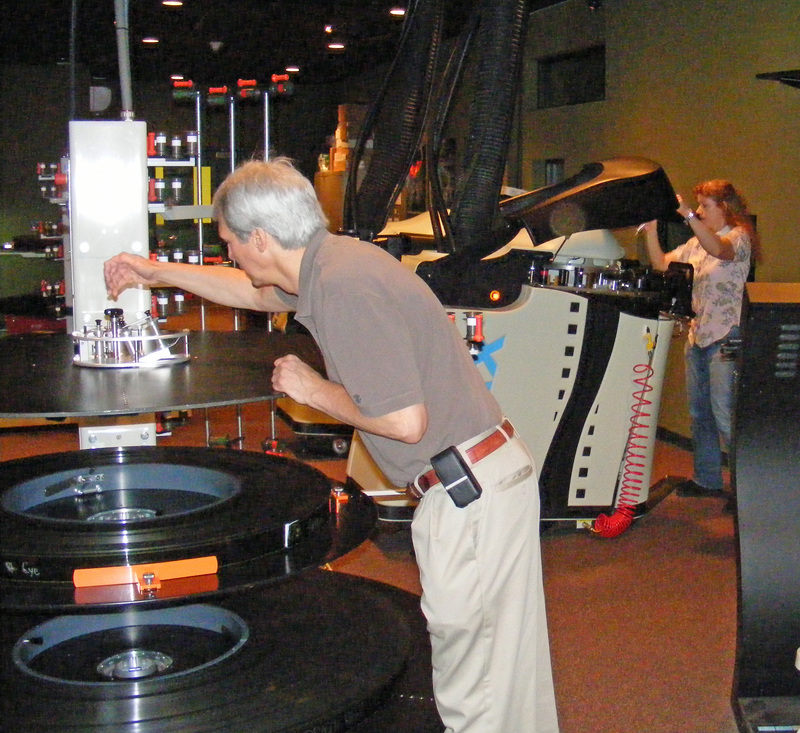 70mm IMAX film is fed from a revolving platter to the IMAX projector. Not only was the 70 mm IMAX picture on the huge screen, one of the largest in the Southeastern United States, an impressively immersive experience, the projection booth was also big and elaborate. The two IMAX 70 mm film projectors filled the largest projection booth I have ever seen. Now, the theater is showing a huge picture on the Giant Screen that is, in my view, just as good, or in some ways even better, with projectors that that don’t come near filling up the booth. Giant Screen Christie Laser projectors use hard drives, DVDs, live digital presentations, anything on a computer instead of film. Another plus, he said, on the laser side is that 4K Xenon lamps last about a thousand hours, whereas laser lights will last ten years or more. That’s one reason that the National Infantry Foundation decided the laser system would provide longer life and lower cost of ownership. Also, going totally digital saves thousands of dollars in shipping charges. Film and film canisters are quite heavy. Hard drives and DVDs are not. Now, all the theater needs is YOU. The last two times I went, the theater was almost empty. That’s hard to understand because the documentaries that are being shown on a regular basis are really worth seeing in my view. Fortunately, the free movies shown in the summer for the kids draw good crowds. The museum comes out ahead on them because the concession stand does well. Movies and popcorn go together. The sea change in cinematic theatrical projection is the relatively recent switch to digital systems. Just as the way film systems evolved technically, digital is doing the same thing. Film went from grainy black and white flickering silent cinema to sound on film and color and from almost square screens to widescreens that got larger and larger. Digital has gone from 2K definition which allowed some pixels to be seen to 4K which solved that problem and from and from light bulb to laser lights. 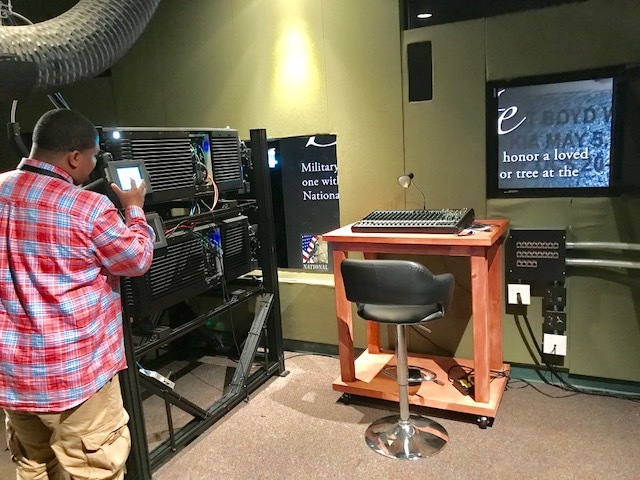 The National Infantry Museum has one of the very few theaters in the Southeastern United States with state-of-the-art Giant Screen laser projectors. The museum’s theater also has one of the largest screens in the Southeast. 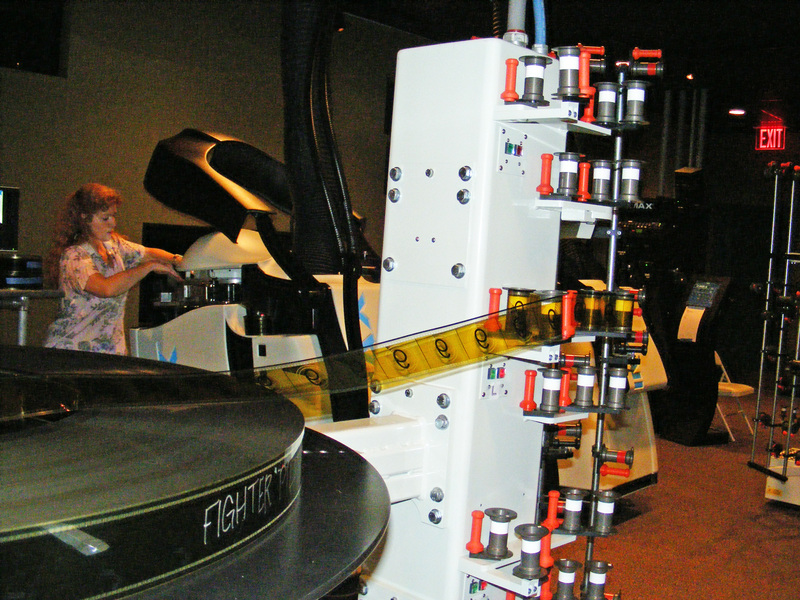 70 mm IMAX film projectors took up a lot space in the large NIM IMAX Theater projection booth. I took this photo in 2010. Up until last year, the NIM still used IMAX 70 mm film projectors. IMAX 70 mm was as good as it got in theatrical projection until digital laser came along. When IMAX switched to digital laser, the museum dropped IMAX and switched to Christie 6P laser projection, and changed the name of the theater to Giant Screen. When I saw the new documentary “Aircraft Carrier,” I was so impressed with the experience I decided I wanted to learn more about the Christie laser projectors. I wondered why the huge picture on the screen seemed so much more vivid and immersive than the one produced by 70 mm film projectors. I was able to take a look at the projectors and get an interview with Theater Technical Manager Brad Skipwirth. I’ll take you inside the projection booth in my next post. What Does it Take to be Best Actor? We’ll learn February 26th, 2017, who gets this year’s Academy Award for Best Actor, and, of course, who gets one for lots of things. But, acting is what I’m discussing here. What does it take to be a good actor? I am no expert on the subject, but I have done some amateur acting. My first role was Santa Claus in a play I wrote in 1942 in the 7th grade at Eleventh Street School in downtown Columbus. We performed it for the 6th and 7th grades. You can read about it and a lot more in my memoir The Newsman: a Memoir. I also did a part in a play in 1943 at Columbus Junior High School, then one at Teen Tavern in Columbus when I was a teenager. I played Petruchio in Taming of the Shrew for Columbus Little Theater, which was morphed into the Springer Opera House after that, and I acted in a number of plays for the Springer and for Theater Atlanta in the late fifties and sixties. Theater Atlanta exited the stage before the Alliance Theater came into being. Considering all that, maybe I can say what it takes to a be good actor with a thimble of expertise. First of all, learn your lines. The drama professor at Agnes Scott said she was so happy that I would act in some of the school plays because she knew I would learn my lines. Just that accounted for a lot she said. She said nothing about the quality of my acting that I can remember. Some of the male teachers at Agnes Scott, a women’s college, would help her from time to time, but she had to go outside the school had to ask male amateur actors to participate in school plays. I think I did minor parts in two plays for her. Second suggestion: concentrate. The Springer’s first director Charles Jones emphasized that a lot. He said it’s really important in everything you do. I agree. O.K., now here’s what some experts reportedly said about acting. Now, if we really want to get serious about this we could discuss the different schools of acting, things like method acting, naturalism, non-naturalism., realism, and romanticism. I don’t want to get that serious. To me, the litmus test for a symphony orchestra is how well it masters the classical music master Beethoven. Saturday night the Columbus Symphony Orchestra, in my view, definitely mastered the master. It didn’t hurt that it had a world-class concert pianist to dazzle us. Swiss-born American pianist Gilles Vonsattel’s rendition of Beethoven’s Piano Concerto No. 3 in C Minor, Op. 37 was…well… breathtaking. I didn’t know anyone could move their fingers that fast. Judging from the standing ovation he got, I would say that the audience was transported. I know I was . 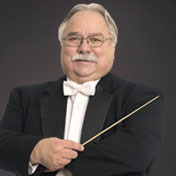 Once, when rehearsing the Bob Barr Community Band, retired legendary public school music educator George Corridino, not pleased with the way the band was playing the Sousa classic Stars and Stripes Forever, told the band that it simply could not get away with not playing that song well. “Everybody in the world knows that song! They’ll know you’re not playing it right.” When it comes to Beethoven, it’s probably Symphony No. 5 in C minor, Op. 67. That’s the one that its first four notes have the same rhythm as the Morse code’s “V.” The British used it to stand for “victory” during World War II. I remember that. I was 14 when World War II ended. To put it mildly, the Columbus Symphony Orchestra nailed it. It was really good to hear CSO Executive Director Cameron Bean announce before the concert that there were 200 middle school students in the balcony. Leter, he told me a sponsor made that possible. It’s really important to expose young people to the sound of a live full symphony orchestra. I was 15 when I first heard one. The Three Arts League brought the Pittsburg Symphony Orchestra to Columbus. A wealthy Columbus lady bought tickets for all members of the Jordan and Columbus High bands. We sat on the first and second rows. I have loved live symphonic music from that moment on. Maybe not a lot last night because there very few people sitting in the mezzanine of the Bill Heard Theater. But, for those few of us who were there, we got a very good view of a pretty messy stage floor apron. The turn-out for the Rising Stars of the Metropolitan Opera concert was not impressive. The three sopranos, a baritone, and a pianist/emcee were quite impressive. Too bad so few people were there to hear them. I guess not many Columbus folks are into opera concerts. They do seem to show up more when a popular opera with a pit orchestra and sets play the Heard. There were good crowds for Madam Butterfly and Carmen when road companies brought them to town. I know, because I was there. It’s good to see that the Columbus Symphony Orchestra is playing symphonic music that everyone can enjoy. I like a lot of the classics, but a good way to get the general public to become symphonic music fans is to play new, popular movie scores like the ones featured Friday evening in the Bill Heard Theater at River Center. Maybe it would be a good idea to do more pops concerts during a season. This one starts at 7:30. Hope to see you there. Also, there will be a costume party before the concert. Sounds like a winner to me. Anyone interested in restarting a film society group in Columbus, Georgia? I don’t know what happened to the one that existed at one time, but I think it would be fun to have one now. After all, the Screening Room at the Ritz 13 is showing a Carmike Classic every Tuesday night at 7. All seats $5. Not bad. We plan to make the next one and hope to see you there. We saw “Raging Bull” last night. Robert De Niro turned in an incredible performance as Jake LaMotta. 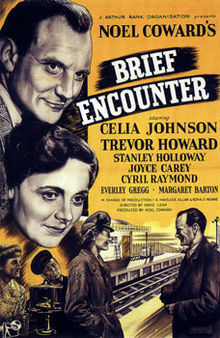 This Tuesday, July 7, it’s David Lean’s (yes, the fellow who directed “Lawrence of Arabia”) production of Noel Cowards “Brief Encounter.” It is indeed a classic. When I was young, fiction interested me more than non-fiction. Since my family subscribed to both the Columbus Ledger and the Columbus Enquirer, I did see the front page headlines on the way to the comics and movie ads, and I did see the newsreels when I went to a movie, so I did have an idea of what was going on in the world. But it was the feature films and the cartoons that I cared about. Then, as I got older I became more interested in reality. A highlight of the year was radio, and later, TV coverage of the Democratic and Republican National Conventions. And when, as a teenager, I got into radio broadcasting, announcers did a little of everything back then. They read commercials, newscasts, and hosted disc jockey shows. It was the disc jockey shows that I wanted to do the most. Still, reading wire service radio news copy served me well when I matured enough to specialize in news, first on radio and then on TV. 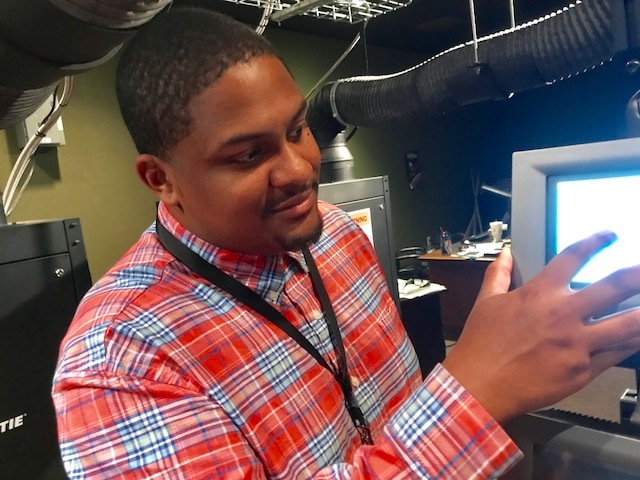 I learned to interview news subjects, edit audio tape for radio, and shoot and edit film and video for TV news. I basically stopped reading fiction, concentrating on non-fiction. But, I never stopped going to the movies, watching entertainment TV, and listening to music, live and recorded. All of us need some escape from the real world. And now I find myself escaping even more when I watch TV and go to the movies. There is so much distressing news in the world. Fortunately, there are enough quality TV programs and movies to hold my interest. A prime example of quality TV programs is Downton Abbey. The British are especially good at producing period series and movies for TV. Downton Abbey is over for this year, but Selfridges, another excellent period series follows it, so I won’t complain. What to do? Watch Downton Abbey or the Oscars? We watched Downton Abbey while recording the Oscars. Fast forwarding through all the commercials and the awards that didn’t interest me, I got to watch the Hollywood pat-itself-on-the-back show in a lot less time than watching it live. There were almost no surprises. The predictors got just about all of them right. There was some uncertainly about Best Male Actor. Some predicted Michael Keaton would edge out Eddie Redmayne, but he didn’t. I was glad. Keating was really good as Birdman, but Redmayne was brilliant as astrophycist Stephen Hawkins in The Theory of Everything.